Disneyland starts celebrating the holidays at Halloween, with lots of unique decorations and activities for Disney’s HalloweenTime. What was already a fun time to go is now even busier, but our tips for planning ahead will help you make the most of it. Not to be left out, the bakeries and eateries may also feature seasonal goodies. If you plan to visit Disneyland during the Halloween season, check their calendar ahead of time to be sure you know what the hours are. On days when Mickey's Halloween Party is held, the park closes earlier than normal (unless you have a separate ticket for the party). For a few days after the decorations go up and on Halloween night, the place gets jam-packed. If you can, try to go on a Sunday or weekday, when crowds will be smaller. If you're going for more than one day, buy your Disneyland tickets online in advance to avoid standing in line for them. Use Ridemax to avoid standing in line at the rides. Reserve Disneyland tours such as the Happiest Haunts Tour or Walk in Walt's Footsteps a month in advance. Call 714-781-4585. Make reservations for Disneyland restaurants such as the Blue Bayou at least two weeks in advance at 714-781-3463 or reserve online. Halloween decorations appear everywhere in Disneyland, starting at the entrance gates. 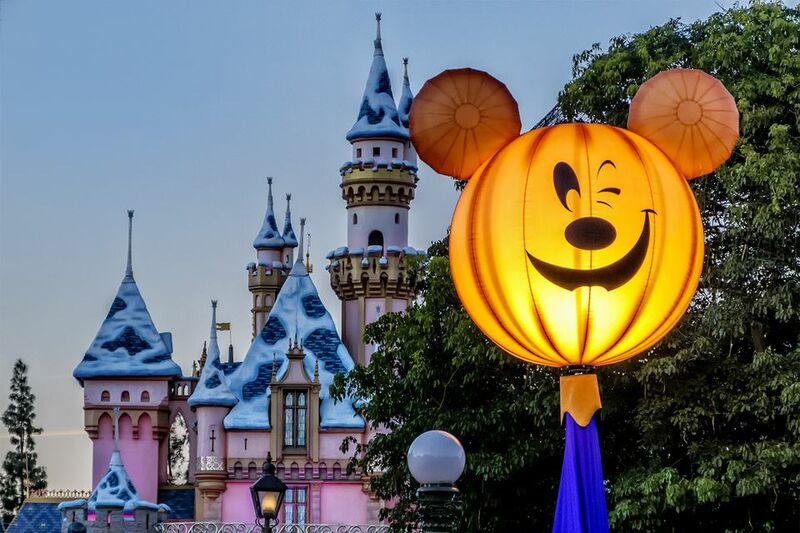 Town Square at the end of Main Street boasts a 16-foot tall Mickey-Mouse-shaped jack-o-lantern that's very popular for photographs, and Main Street is decked out in orange and yellow bunting, with more than 300 pumpkins peeping from its windows. Many of the Disney characters will be wearing their Halloween costumes as they greet guests. Young girls especially seem to enjoy wearing their Disney princess outfits while visiting the park, and if you buy them one for their visit, they can wear it for the holiday, too. The special Halloween decorations in Haunted Mansion Holiday, based on Tim Burton's "The Nightmare Before Christmas," are extensive and whimsical, with jack-o-lanterns replacing the hitchhiking ghosts and Jack Skellington's sleigh perched on the roof. The entire building is redecorated with such attention to detail that you may want to ride it twice to take it all in, and be sure to stop by after dark when candles flicker outside. Every year in the fall, a bunch of ghosts move into Space Mountain, bringing along a soundtrack and special effects just for the holiday. Aboard a haunted starship, riders navigate through pitch black space, dodging past glowing projections. During the ride a chorus of screams and ghostly music provide the soundtrack. Outside, projections turn the roof into a morphing montage of textures and effects. Experience Disneyland after hours at Mickey's Halloween Party. On select nights in September and October the park hosts a family-friendly night of fun. There are parades, fireworks, and trick-or-treating stations, along with the chance to snap photos with Disney villains and ride the park's rides. Adults can wear costumes to the party; a privilege restricted to the under-ten set the rest of the year. Separate admission tickets are required to attend the event. It's a fireworks show created just for the season, but it only happens during Mickey's Halloween Party. Jack Skellington greets the crowd and as the fireworks burst overhead, there are images of famous Disney villains and ghosts projected on Sleeping Beauty's Castle, all set to a medley of Halloween music. Disneyland comes up with sweet treats for every holiday and season. These candy apples were on sale in the candy shop window on Main Street USA. You can also pick up a pretty inexpensive souvenir at Halloween, especially if you like popcorn. The bucket is different every year. In the past, it has featured Zero, who is Jack Skellington's faithful ghost dog in Tim Burton's "The Nightmare Before Christmas" and a cute Cinderella's carriage. This 2-hour historical tour of Disneyland takes guests on a journey throughout the park. The guide will share ghost stories as you walk thorough the park, and will teach you about characters and spirits from The Haunted Mansion and films throughout the decades. The tour costs $85 per person and everyone receives a special treat and commemorative pin. Call 714-781-4565 to reserve it, up to one month in advance. Most of the Halloween-themed rides are in Disneyland, but at California Adventure, Oogie Boogie from Tim Burton's "The Nightmare Before Christmas" takes over with his twisted tale of a forever Halloween. Cars Land gets a Haul-O-Ween makeover as the citizens of Radiator Springs don Halloween costumes and decorate their respective homes for the season. Guardians of the Galaxy–Mission Breakout gets a special Halloween rescue mission in Guardians of the Galaxy–Monsters after Dark, Mater’s Junkyard Jamboree turns spooky as the Graveyard JamBOOree, and Luigi’s Rollickin’ Roadsters getting a seasonal twist to become Luigi’s Honkin’ Haul-O-Ween. As is common in the travel industry, the writer was provided with complimentary admission for the purpose of researching this story. While it has not influenced this article, TripSavvy believes in full disclosure of all potential conflicts of interest.